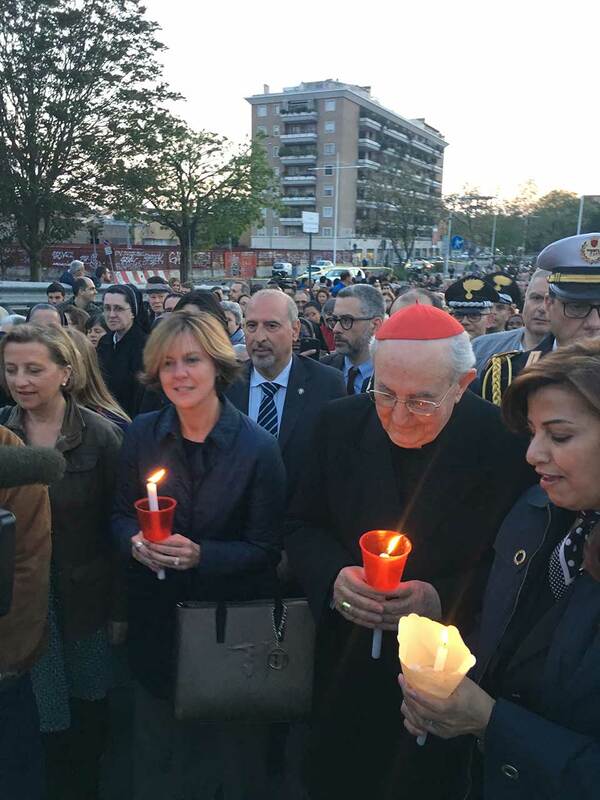 Mrs. Kader took part in the Via Crucis for " The Crucified Women "
It was held on April 7 last, the third edition of the Via Crucis in favor of women victims of trafficking, forced prostitution and violence. This event, created by the Community “Papa Giovanni XXIII”, in collaboration with the Diocese of Rome South, was organized to raise awareness of the plight of these young women, more than 100,000 between 15 and 25 years, to which it is our duty to give them back the hope of a better life. 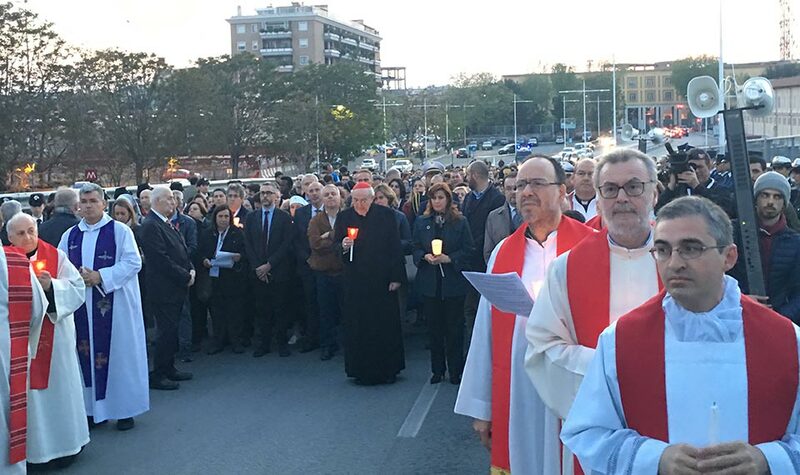 The Via Crucis, departed from Ponte Settimia Spizzichino, Garbatella area, concluded after seven symbolic stations to the Church of Santa Francesca Romana. The event was sponsored by many institutional, civil realities, religious associations and saw the extraordinary presence of the State Police and the Vatican Gendarmerie. Present at the event the Foreign Minister Angelino Alfano, the Minister of Health Beatrice Lorenzin, the European Parliament President Antonio Tajani, the Ambassador of the Great Britain to the Holy See Sally Jane Axworthy, the Substitute for General Affairs of the Vatican Secretariat of State, Archbishop Giovanni Angelo Becciu, magistrates of Rome, other authorities, representatives of the press and RAI. 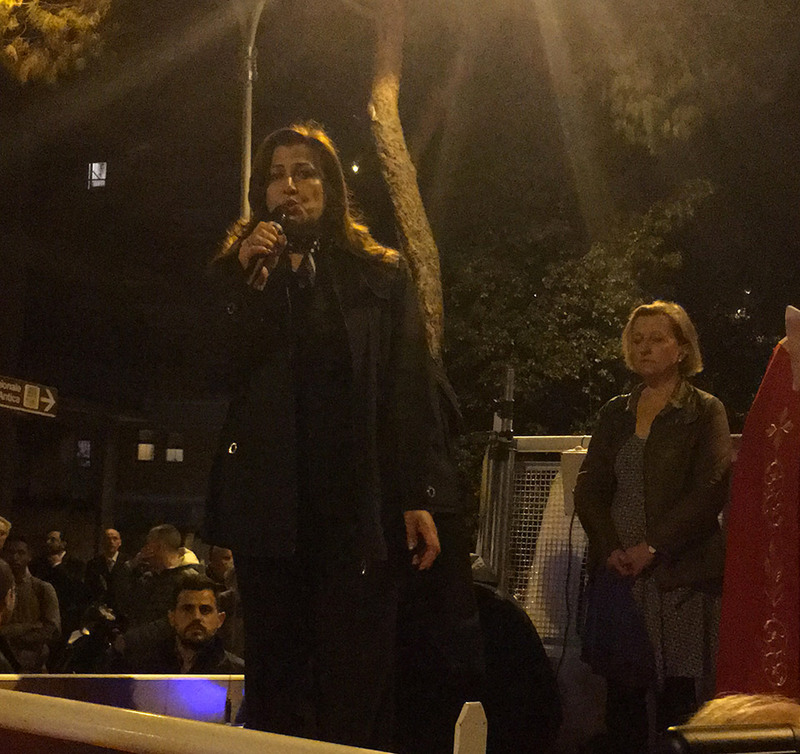 The High Representative, Mrs. Rezan Kader, brought the evidence of her experience in one of the stations, referring to all Kurdish women, in particular Yazidi and Christian, who have been the subject of slavery and sexual violence by ISIS terrorists and many of which are still in their hands. Mrs. Kader has appealed to the international community for solidarity and help for these women. Even released, they need a long psychological support to be integrated back into society and in their families of origin and to overcome the shock experienced. The President of the Papa Giovanni XXIII Community Giovanni Raimonda, along with the event coordinator Don Paolo Buonaiuto and Don Paolo Lojudice, archbishop of the diocese of southern Rome thanked the Holy Father for having deeply supported this via crucis and the heartfelt participation, together with Cardinal vicarious of the Holy Father for the diocese of Rome Agostino Vallini who concluded the event by inviting everyone to never give up and take action to provide, each of us, our small but important contribute. The High Representative was, at the conclusion of the event, interviewed by Rainews24.